The day, filled with family and fun, had been fervently enjoyed, but the day had passed to night, and Farmer Dean and I were on the way home to the farm. Perhaps you often wonder, “Why does she call him, Farmer Dean?” Well, some people call their spouse “honey,” or “sweetie,” for endearment. I call my dear husband, “Farmer Dean.” He is a farmer, and he knows that it is my term that shows I love him, and so, it’s what he is called. I am called, “Ma’am.” I don’t try to figure it out. Perhaps we’re just odd ducks. Farmer Dean was driving and looking across the fields, as we watched snow blowing and drifting in the small packed piles on our country road, when he said, “I just don’t see how we’ll ever find it.” He referred to a counter for Frank Lake Covenant Church in the Grove, as we are trying to complete our kitchen area. We had spent many hours, thus far, looking for an old counter, where our Bible studies can have their treats and coffee spread out, or where we can display information. But nothing seems to fit, and nothing seems to be affordable or fit in that spot. I groaned…..literally….outloud. And thus began our one hour conversation on worrying, doubt, fear, faith and the in-between. The snow continued to float above us and the roads would frequently pull us one way or another, much like the winds of this life, but we remained in tact and on the road. At times, it’s hard for me to understand worrying, until I partake in it myself. It isn’t something I strive to do, or allow myself to do very often, but when I do, I can relate to Farmer Dean. He is a worrier. He has many fabulous traits, mind you, but that is not one of them. Kathy-Remember last January? I felt a pressing of the Holy Spirit, telling me that the time was coming, the four-year prayer for a headquarters for the ministry would be arriving, and I was to be ready. 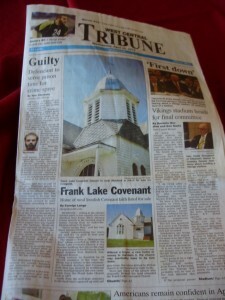 The morning of April 25, 2012 arrived and the paper displayed a fabulous old church. I raced in my sandals to stand in the grassy yard of the most wonderful church I’d ever seen. And…it called to me. It was a friend to me upon sight. And when I left it that day, I knew it would never do for us to be apart. Farmer Dean-Ma’am, I remember when I got there and looked at it, I figured it was the best thing for you and the ministry and my brother thought the same thing, as he sat at Walt’s in Willmar, getting his oil changed, while reading the paper and seeing it on the front page. Kathy-But the worrying began then. How to move it? How to raise the funds? How will it work? Who will help? How to the pieces fit together? And God orchestrated each and every thing, according to His timing, His will, and His purpose. We saw Him move in the situation in a powerful way! (I continued) People, dear, sweet people, arose to the occasion. Tv cameras and crews, newspaper interviews arose, all the while, volunteers showed up in our lives to donate work, time, and money to the project. And most of them didn’t know us…but they knew God. The quest of searching for antique front doors and sanctuary doors was completed with 5 doors from Dassel’s Little Red Hen. While the search for a pew, a table and chairs, Bibles, a sink and miscellaneous items were all pleasantly provided, one by one, from various people and places across the Midwest. We watched as God provided the best year that our ministry has had. We watched as He blessed and brought us together under one roof, and now we watch how He is using our conferences to bring people to Him, and help women throughout the weekly Bible studies. How can we complain? How dare we question God and ask how He can provide a simple counter, or another antique table and chairs (since we’ve outgrown the one we have), or a small refrigerator? We have seen Him work miracles in 12 short months. Why would He stop now? Dean-You’re so right….I just forget all of that as I’m looking for the next problem. I don’t focus on all the ways God took care of things. I will try not to worry. Our thoughts are so human, aren’t they? We cannot think about what God has done, without hoping for what He will do. We cannot go before the throne with our requests, without preempting them with the answer “no.” And we cannot begin to say, although we try, that we sit within the all-knowing power of God, and know better. Today, I challenge each one of us to take the next moment and think about the Mighty God we have, the answers to the deepest, most desired requests of our hearts, and reflect on how He has provided. Because His will is for our BEST. And for tonight, amidst whirling snow, and icy roads, I take comfort in a God who provides help, hope, kitchen sinks and counters. 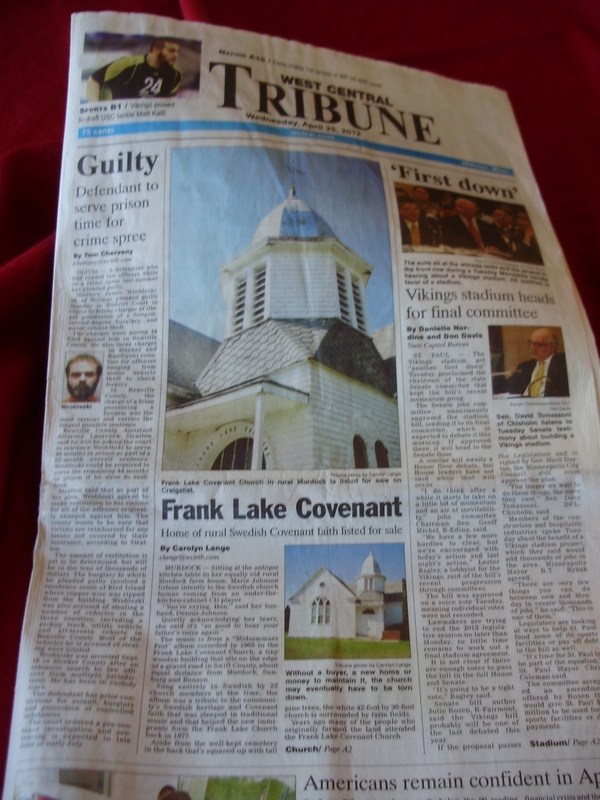 Kathy’s Note: Tonight, Feb. 3, 2013, PBS out of Appleton, MN, channel 10, is airing their coverage of the move of Frank Lake Covenant Church to our grove here in the countryside of Benson, MN. If you do not get that station, we will post it on our site next week.